Clu Clu Land is a sort of action/puzzle game that...well, think if your school playground consisted of nothing but tetherball poles without the tetherballs. You'd probably just run around grabbing onto ones at random, swinging around, and then letting go to grab onto another, right? That's essentially what this game is, only some spots that you run over reveal what appear to be rupees from the first Legend of Zelda and your goal is to find all of these without slamming into any of the enemies or running out of time. 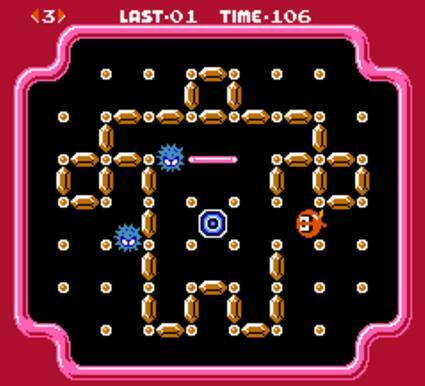 Later levels introduce more obstacles or force you to run over the rupees twice but the gameplay remains the same: swing around like a stripper on crack. These days, Clu Clu Land is still available, even if you don't have a GameCube copy of Animal Crossing laying around. Anyone with a Wii, an internet connection, and 500 Wii Points to spare can pick it up on the Wii Virtual Console. Although I don't know if I can ever fully recommend throwing five bucks at it, it is one of those games that's great to pick up and play for half an hour here and there.